Heart fluttering and a love affair going on for this beautiful quilt! Pretend the shadows aren't there............this was taken the same day I took photo's of The Crinoline Ladies. ( remember in between the showers day!) Another beautifully made quilt by Veron. Hours of custom quilting went into this quilt, but I enjoyed every delicious moment! This is a large quilt: 85" x 100" each Dresden block is 15" square. I SID (stitched in the ditch) around each Dresden then echoed a 1/4". Pebbles and the odd swirl was the background fill. I then quilted using my ruler star points alternating with a swirl. The mini Dresdens were sort 'corner stones,' had their own special quilting. The soft green sashing was treated to swirls and a feather vine. Designing the shapely border was fun, breaking the area up appealed as did some curved cross-hatching and feathers. The outer border received the same breaking up method, this time a cross-hatch, then a pattern meander to create some nice texture. Thank you so much Veron, it is ALWAYS a pleasure working with you! Over the past few weekends when I had a few hours available I worked on my Star Mastery quilt. I attached the borders and all the applique shapes in place, just needing to blanket stitch then to quilt it. Another 'finish'..........not really a finish' finish', but another round of The Country Yard's Mystery Medallion, my version. Both of my projects are scrappy with a strong blend of Kansas Troubles fabrics. Liz and Sue...............that ones for you! Oh my goodness, what a gorgeous quilt. Love Veron's choice of fabrics. Nit enough words too describe your anazing quilting. 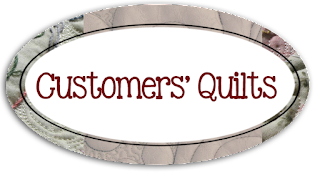 Superb designs for your quilting, it shows the design perfectly. And of course, a beautiful cat to finish, the best. Oh wow!!! Another masterpiece in both quilt and quilting Leeanne!! Your Star quilt is amazing too..and your next part of the Mystery Medallion...love the cat photo...blowing raspberries???? Simon has more than one fan??? Of course he does, just look at him poking his tongue out. PS: That first quilt is beyond beautiful. Veron's quilt is gorgeous, she'll be so excited with her mail!!! Neat to see your other CY projects too - you have been busy beavering away - well done! I'm naughty and don't comment often, but I look in each time you post. I have to say, the Crinoline ladies and the Dresden quilt are beautiful and I love the quilting work you have put into them, amazing. Love the quilting - it compliments the design perfectly. Out of curiosity, do you use a walking foot for the lines or do that all with the freehand quilting foot? Beautiful, love how you quilted the green sashings. I never know what how and what to quilt on a quilt. Love your others qults too! The Dresden quilt is gorgeous and I so love the quilting you have stitched on it! 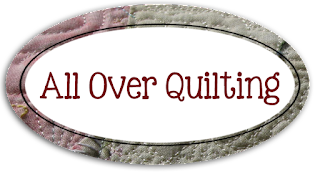 Can't wait to see what you do with your finished quilts! Must be so good to have a finish!! The quilt is divine, and your quilting dear girl is exquisite! Veron has made two of the most beautiful quilts, your quilting is wonderful. I think the cat is jealous now, giving you the raspberries, you are an inspiration to all quilters, lovely to see what is happening at the Country Yard. Oh that dresden quilt is beautiful, such soft feminine colours. You sort of forget there are fabrics like this out, when all we see are big bold modern ones on the internet.